Our Term 3 Drama Workshops have already begun. If you would like to join our Term-Time Drama Programme for children aged 3 through to 18, please call us at 2547 9114 or email Info@FaustWorld.com. All members registered in Term 3 (except those in Stage group, Tots groups and our School Programmes) will perform at the Faust Festival. The Faust Festival is our annual theatrical showcase and celebration of youth theatre, taking place at the end of Term 3 (late-May to mid-June). The festival is the perfect opportunity for members to experience the excitement of sharing their dramatic skills and talent, live in front of an audience in a dedicated performing space! This also provides our members with a great insight to everything involved in a theatrical production. Please note that children aged 4 to 5 must have completed a drama course with Faust (Term-Time Drama, School or Holiday Programme) before joining Term 3. Click here to learn more about the Faust Festival! Faust aims to provide a fun-filled learning environment for children aged 3 through to 18 to develop greater self-confidence, teamwork and drama skills. With our qualified and experienced leaders, unrivalled resources, great facilities and over 18 years of experience we offer the best of drama and theatrical education. Faust’s workshops provide insight into the world of theatre and enables members to explore drama in its wider social and cultural context. Through fun and laughter, we offer a colourful approach to learning, igniting imagination and encouraging students to surpass expectations. Our team-building focused workshops aims to gently boost your child’s confidence and help them thrive in an English speaking, group environment. At Faust, we believe the process is just as important as the performance, which means your child has the opportunity to flourish within every moment of our workshops. 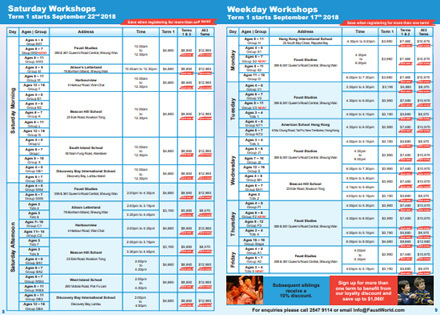 We also offer performance opportunities for our members on a wide range of youth theatre productions in Hong Kong. Each season consists of three terms. 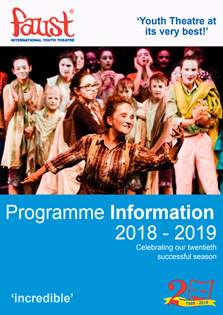 The first term starts in September (10 workshops), the second in January (10 workshops) and the third in April (8 or 9 workshops for Stage and Tots Group, 9 workshops with a performance at The Faust Festival for other groups). Start dates are listed in the term schedule which is always emailed to our members. Each term parents are sent a term schedule with key dates and information outlining what their child will be doing. For more details about our workshop content click on the links below to get a sample of what our term schedules have previously included. 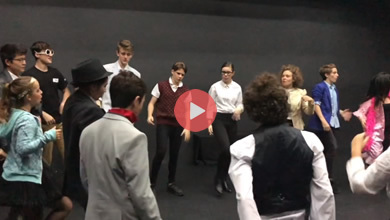 Below are some videos of our Faust members in action during their workshops.